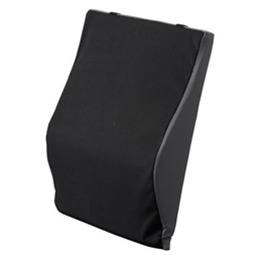 This 16” Back foam cushion (2611BK-16) has a stabilization board insert that provides back support, as well as a contoured foam cushion, which adds comfort and helps to improve posture. Its adjustable nylon straps secure the position of the cushion and are easy to attach. The cover is made out of polyester/cotton and is removable and machine washable. The weight capacity for this cushion is 250 lb.